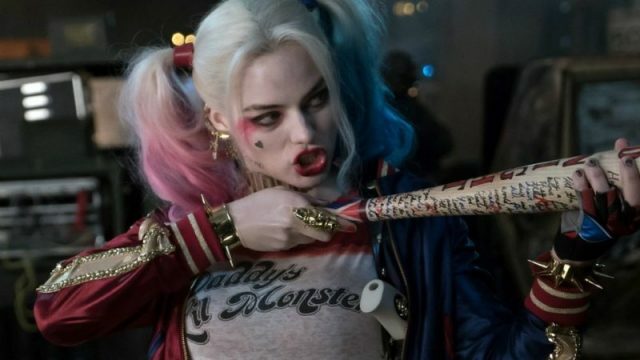 Birds of Prey (and the Fantabulous Emancipation of One Harley Quinn) is coming in less than a year, and now the upcoming movie has officially wrapped production. The shoot began in January and now LuckyChap Entertainment has taken up Instagram to celebrate the occasion. Its latest photo features a multicolored Harley Quinn seated in a director’s chair, and the caption “that’s a wrap.” The 2020 film will mark Harley’s return to the DC Extended Universe after 2016’s Suicide Squad. Moreover, the photo shows an eccentric logo blazoned on back of the director’s chair. This is likely the first look at the official logo of the Warner Bros.’ upcoming DC film. The letters include the silhouettes of an arrow, a bow, a dagger, a baseball bat, a diamond, a mallet and brass knuckles. Furthermore, part of the logo is presumably signed in a pink lipstick. The leading actress, Margot Robbie, is also producing Birds of Prey alongside Sue Kroll and Bryan Unkeless. Moreover, Cathy Yan is directing Birds of Prey from a screenplay by Christina Hodson. In Birds of Prey, Harley joins forces with Black Canary (Jurnee Smollett-Bell), Huntress (Mary Elizabeth Winstead), and Renee Montoya (Rosie Perez) to help protect Cassandra Cain (Ella Jay Basco) from Black Mask (Ewan McGregor). The movie also stars Charlene Amoia as Maria Bertinelli, Chris Messina as Victor Zsasz. Steven Williams, Derek Wilson, Dana Lee, François Chau, Matthew Willig, and Ali Wong have been cast in undisclosed roles. Birds Of Prey soars into theaters on February 7, 2020.